Accepted: We’d like to get to know you! Where are you from? Where and what did you study as an undergraduate? What is your favorite ice cream flavor? Ashley: Let’s start with the good stuff! My favorite ice cream flavor is “Tahitian Vanilla Bean Gelato” by Talenti. I grew up around a military lifestyle because my father was in the Marine Corps. I have lived all over the United States and even spent a few years growing up in Japan. After high school, I went to school at UNC Charlotte in Charlotte, NC. I was interested in cultures, history, and science so I decided to major in Anthropology with a minor in Sociology. That is one of the best decisions I’ve made. Accepted: Where are you currently in school? What year? Ashley: I currently go to an osteopathic medical school: Philadelphia College of Osteopathic Medicine – Georgia Campus. My school is located in the perfect city: Suwanee, GA, which is right outside of Atlanta. I am in the Class of 2019! Accepted: Why did you choose Philadelphia College of Osteopathic Medicine – Georgia Campus? How was it the best fit program for you? Ashley: I chose this school for three reasons: the focus on primary care, the diversity within the class, and the location. I used to live in Georgia during the first part of high school, and I loved it here because it is close to my family in Alabama and North Carolina. Our school is also very inclusive and has a diverse class of different ethnicities, ages, marital statuses, and previous experiences. Some of the students here were in the military, some know four languages, and some students were like me and came directly from undergrad. I personally enjoy a class with different people because it helps me learn more about various groups and develops my social circle. Lastly, my medical school makes an effort to incorporate primary care and preventive medicine into our studies through a detailed Osteopathic Manipulative Medicine curriculum, use of standardized patients, and a fluid integration of clinical correlates within lectures. Accepted: What’s been your favorite class so far? Ashley: Thus far, my favorite class has been Primary Care Skills. In this class we routinely work with standardized patients and learn how to blend our coursework with clinical skills. I enjoy this class because I take pleasure in speaking with the standardized patients, writing a SOAP note, and using our medical equipment. This class truly teaches us how to incorporate anatomy, immunology, and other classes into our hands-on practice. Accepted: Can you tell us about your shadowing experience? How important do you think it is for premeds to have this sort of experience? Ashley: When I was a pre-med, I considered shadowing doctors a top priority. I was fairly young when I started college, and I felt pressured to figure out whether medicine was the right career choice for me. So I set out to determine what exactly a physician “does.” I first began shadowing different doctors during the Science Enrichment Preparation Program in Chapel Hill, NC. This is an eight-week summer enrichment program dedicated to giving students a closer look into medicine. The shadowing experiences included days with various primary care physicians including two family medicine providers and a pediatric physician. This helped me jump start my interest in medicine because I received a behind-the-scenes look of a hospital, a primary care clinic, and a solo practice. After that summer, I formed a close relationship with my own pediatrician and shadowed her for the next three years. Once I discovered Osteopathic Medicine, I reached out to a D.O. orthopedic surgeon that performed an operation on my father to learn more about Osteopathic Medicine. These experiences combined helped me observe different sectors in medicine and realize whether I could fit into a physician’s lifestyle. Accepted: Do you know what you want to specialize in yet? Ashley: I try to keep an open mind about my future specialty but from my previous shadowing experiences, advice from established physicians, and time thus far in medical school, I am interested in psychiatry and primary care specialties – only time will tell though! Accepted: Can you tell us about your involvement with the Student National Medical Association? Ashley: The Student National Medical Association (SNMA) is the best organization I am a part of. Not only are many of the students involved in SNMA eventually going to be doctors like me, but this club celebrates diversity and inclusion. There are many under-represented groups in medicine and SNMA strives to advocate for these groups and I enjoy being a part of the leadership team. I am most thankful for the opportunities to connect with other members, contribute articles, and attend conferences. Furthermore, my first leadership experiences were on SNMA boards and I learned a lot about myself and what it takes to lead others. Overall, SNMA creates a family-like environment for their members. I have volunteered with, mentored to, cried with, laughed with, and been successful with SNMA members. If I could do it all again, I would still choose to be a part of the Student National Medical Association because of its strong impact on my medical journey. Accepted: What are your top 3 tips for med school applicants? Ashley: This is a great question! My top three tips for applicants are: find yourself before medical school, network with others, and diversify your experiences. 1. Finding Yourself. This is a tough but necessary tip I give to pre-medical students. This is a very personal tip that is dependent on everyone’s individual beliefs and life experiences. Before medical school, there is a lot of free time to hang out and have fun. One thing I have learned while being here is: commitment. To truly succeed in medical school, there are many sacrifices medical school students make. Some of my classmates have families and some students have no support systems living near them. We often miss important births, weddings, and even funerals in order to study for test and meet deadlines. It gets hard sometimes because there are a lot of requirements that no one really tells you about before medical school. As a result, finding yourself and knowing what works for you is a great way to prepare for the pressures of medical school coursework. Figure out how you study best, what motivates you, and what makes you happy. It is very important to know your priorities before you start so you have a game plan and can be successful from day one. 2. Networking. To me, networking is one of the best ways to propel your goals further. One of my favorite quotes from the late Maya Angelou is “Do the best you can until you know better. Then when you know better, do better.” I have learned the most about the application process from other people. Once I learned what I needed to do, I applied myself differently. There is nothing like a first-hand experience but it never hurts to hear how someone else handled a situation. I have enjoyed getting to know professors, doctors, and students all over the world from networking. Often, there are conferences, medical groups, and social media opportunities that can introduce students to influential leaders. For example, one of the doctors that wrote my letter of recommendation was part of a student organization I participated in. She was a D.O. and I believe her influence has helped me be successful thus far. Everyone does not need a mentor, but to me a great mentor can truly be life-changing. 3. Diversifying Your Experiences. There are many Biology and Chemistry majors applying to medical school. I think this is great for people who love Chemistry and Biology! On the other hand, there are Art, History, Economics, and other majors every year that not only get into medical school, but some of the top medical schools in the country. This is why I think it is a great idea to have many different experiences on your application. Do what you love! Please get the highest grades and MCAT score possible but also consider other opportunities for your application to stand out. Were you the leader of an organization? Did you travel abroad for a semester? Were you a medical scribe? Did you organize a benefit for a cause? Or even better, have you been volunteering somewhere for years? All of these experiences further tell your story. Put it on your application! 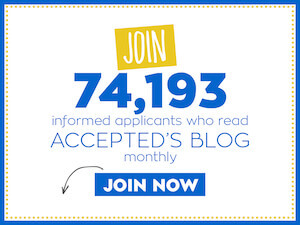 Accepted: Last but not least, tell us about your blog! Who is your target audience? What have you learned/gained from the blogging experience? Ashley: You can find my blog at www.drashleyroxanne.com. I have fallen in love with blogging, as it is my latest hobby. I started this blog last year and have started posting more as my audience grows. I am amazed by the medical community – they are very connected and willing to help! My target audience right now is a pre-medical or medical student who wants to know more about medicine and how to reach their dreams. I often have interviews with popular medical school bloggers and I offer pre-medical advice through different articles. Some of my experiences have been unique and I want to use my blog to show other people that they can achieve their dreams too. From blogging I have learned how to use my own experiences to help others. This is my main goal: to help more people in medicine! You can follow Ashley’s med school adventure by checking out her blog. Thank you Ashley for sharing your story with us!